One of the best parts of Christmas is the overall sense of comfort and joy that come with the season. Yummy food, pumpkin pie, hot cocoa with marshmallows, crackles from the fireplace, friends and family gathered with ugly sweaters, extra cuddles with your favorite puppy or kitten, lights and presents around the tree, and yummy sips of your favorite latte. These are some of the delights of the season, and they reflect a deeper spiritual longing for comfort and joy. We seek peace from God; we look for joy in Christ; we look for comforting reassurance from the Holy Spirit; and we crave warm affirmation from the people around us. Yet, a strange thing happens during this season. We experience tension as well. We see fatal events happening in our neighborhoods and around the world, we hear about people suffering in unthinkable conditions, and we feel guilty about our desire for comfort and joy. We look at our own suffering and wonder how long it has to continue. We hear the words “comfort” and “joy,” and we scoff at their seemingly superficiality. We argue that we should just be about the Lord’s work and not be concerned about comfort and joy. The Christmas carol above speaks of the news of comfort and joy that come as a result of Jesus’s birth, ministry on earth, crucifixion, and resurrection. We look at Christmas and wonder how we can justify enjoying the season with all the calamity that surrounds us, but we forget that the point of Christmas is that we as believers will have ultimate comfort and joy. We celebrate Christmas and Easter as separate holidays, but I challenge you to think of them in a holistic sense. The joy that comes with Christmas reaches its fulfillment in the resurrection of Christ. Without the resurrection, Christmas would be just another holiday. No longer are we slaves to sin; no longer are we without an advocate who intercedes for us; no longer are we without someone who understands the full scope of our deepest pain. The type of comfort and joy that we have as believers is not superficial. No, our comfort and joy will endure even through the darkest of times. Our comfort comes from knowing that we can rely on the Holy Spirit to work on our behalf because of who we are in Christ. Our joy comes from realizing the comfort that is Yahweh. So, the next time you hear a silly song about reindeer on the radio, drink an espresso treat from a red cup, or watch a cheesy movie about some city girl falling in love with a childhood friend from her small town just in time for Christmas, don’t brush them off as irrelevant, trivial signs of the season. 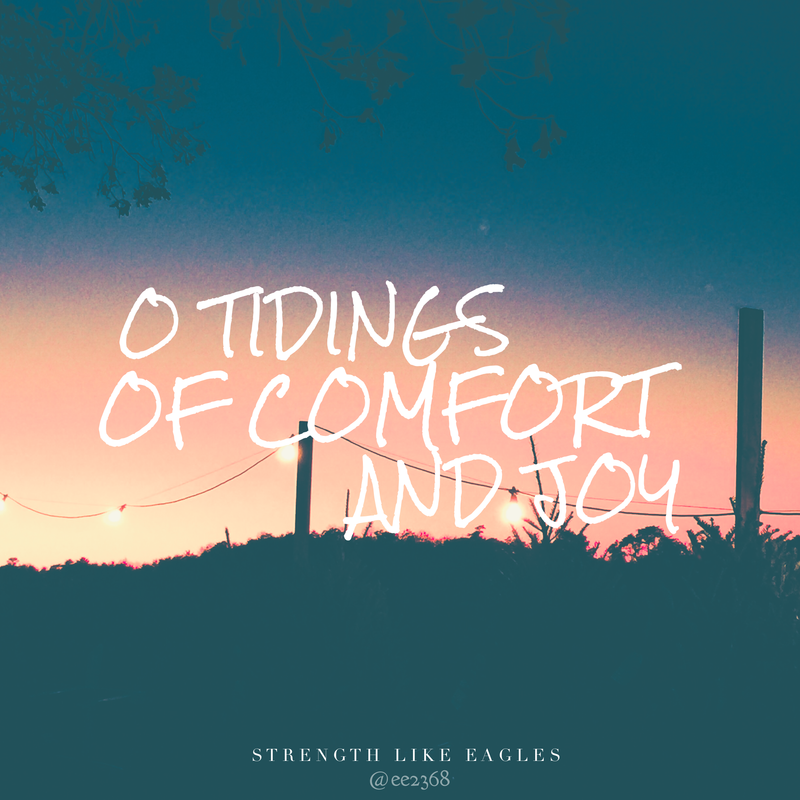 When you see Christmas lights or hear someone belting “Jingle Bells,” remind yourself that God is present in your life and that He is your constant comfort and joy.